Automation tools have become a necessity for successful online marketing campaigns as the ability to accomplish additional tasks in less time has never been more important in this age of information and connectivity. Customers expect more from businesses, and the simple fact is that if customers’ expectations are not consistently met, they will take their business elsewhere. Lounge Lizard is globally recognized as a top New York Digital Marketing Company within the web design and development industry. Lounge Lizard's brandtenders are creative, tech-savvy, and passionate in developing innovative strategies that drive conversion for both startups and established clients of all industries, making them the "best of breed since 1998." Automation tools have become a necessity for successful online marketing campaigns. The ability to accomplish additional tasks in less time has never been more important in this age of information and connectivity. Customers expect more from businesses, and the simple fact is that if customers’ expectations are not consistently met, they will take their business elsewhere. Today the New York Digital Marketing Firm, Lounge Lizard, shares the 5 Must-Have Automation Tools for Marketing. Social Media Management Tools – Social media is used by most marketers as consumers utilize on average between 3 and 8 social media networks, according to a Pew Research Center survey. In that regard, social media is both a blessing and a curse. It is highly beneficial to have multiple channels with which to connect to customers, but it is also difficult to effectively use multiple platforms. Targeting the right audience at the right time with content, responding to comments, being social, and expanding the reach on platforms takes time and a high degree of organization. That is exactly why there has been an influx of social media management tools; to fill a need in the marketplace. Content calendars, content sharing, scheduling, curation, and engagement monitoring can all be automated and simplified to a great degree by using tools such as Buffer, Sprout Social, Simply Measured, or Hootsuite. Email Marketing Tools – Email is still an extremely viable marketing tool. People tend to overlook this very effective and engaging technique which reduces the competition for the smart brands that do use it! Email marketing can be very labor intensive for brands that send multiple emails and newsletters each month, especially when factoring in the level of personalization which customers have begun to expect. Tools such as MailChimp or Constant contact provide a robust stable of options to allow emails to be sent efficiently to specifically targeted groups, along with analytical report generation and personalization. Inbound Marketing Tools – Inbound marketing has a surprising amount of work required to be effective, much of which benefits from automation. SEO, linking building, keyword research for content creation, and even buying ads can be streamlined by using all-in-one software that helps create a cohesive strategy while automating and optimizing processes. HubSpot is one of the most-used tool suites on the market but there are other options such as Drip, Infusionsoft, or Pardot. Content Advancement Tools – In some ways, creating content is the easy part; it is getting it in front of the right people at the time which has become more of a challenge. It wasn’t always this way, but with the sheer number of businesses online creating content, users are often overwhelmed by options. Therefore, getting content to a consumer when they are going to engage with it is so valuable. While tools in this niche share similarity with social media tools, the focus is placed on promoting content on non-social platforms. These tools allow for scheduling and uploading of content along with content and keyword analysis to better understand what people are looking for and even what the competition is doing. Some of the best social media management tools are Sprout Social and Hootsuite. Analytic Tools – Analytics in business should be compared to air for mammals; essential. Businesses operating without analytics to provide information in real-time for better decision making better hope their horseshoes don’t run out of luck because those decisions need to be spot on to stay ahead of the competition. 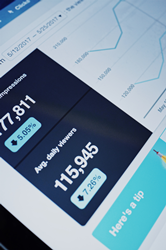 Analysis tools can help track campaigns by focusing on performance indicators and metrics to provide a ton of useful information about engagement, conversion rate, ROI, and so much more. Customer needs and behaviors change faster than ever and using analytics helps recognize those changes allowing a business to adapt and evolve in real-time. HubSpot, Pardot, Marketo, and Looker all offer highly rated software that will meet most any businesses analytical needs.